Outdoor living areas are becoming more and more popular as homeowners invest their time and money into creating an optimal floor plan that incorporates the great outdoors for additional fresh air and sunshine. Colorado is known for its amazing (yet unpredictable!) weather, and being able to spend more time with your friends and family outside is a big plus in a world full of screens. If you have already installed or are thinking about installing an outdoor living space in your Larimer County home this summer, congratulations! Doing so can provide a number of benefits that will enhance the enjoyment of your Loveland or Fort Collins property while also increasing its value. Rocky Mountain Fence & Decks is here to deliver the best results for your outdoor space, creating a personalized plan that fits your style and your budget perfectly. We’re here to provide the best results for your goals, whether you want space to host parties, build an outdoor kitchen for expanded family meals, or create the full spa experience. Our deck builders work hard to deliver amazing outcomes to customers all along the Front Range. One question our Loveland decking company encounters involves the practicality of installing a hot tub on their deck or patio. A hot tub can take your outdoor living space to the next level, providing relaxation all year round. While this addition can prove very beneficial, it’s important to remember the weight and moisture concerns associated with such an undertaking. 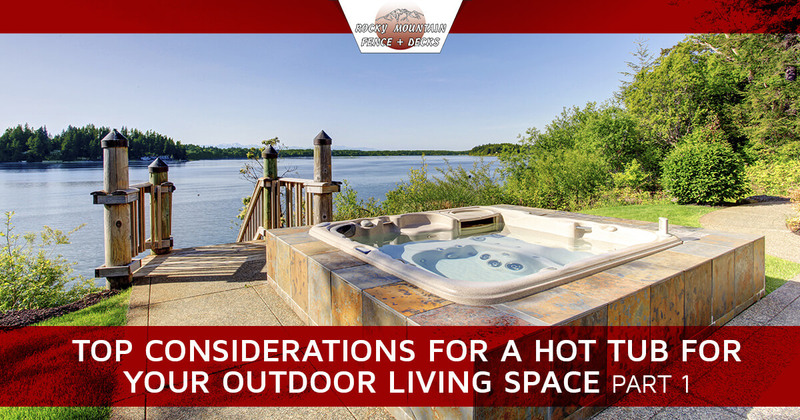 Today, we’ll begin to highlight the biggest considerations when installing a hot tub on your deck. Be sure to contact us afterwards to receive an estimate for your needed decking services! First and foremost, it’s important to find the right product to incorporate into your outdoor living area. Coloradans have a wide range of choices when it comes to spas, jetted tubs, infinity pools, hot tubs, and so on. Each style holds unique requirements when it comes to electrical needs, maintenance demands, style benefits, total weight loads, and more. Be sure to take your time when shopping around, as numerous carriers provides varying benefits for consumers. Style choices are important when shopping for a hot tub, as you’ll want this new improvement to match seamlessly with your current design. Opting for a nice tub and not considering any style implications can result in unattractive outcomes, so be sure to find the perfect tub before getting to work! Foot traffic. The quality of your outdoor living area may be sabotaged if your guests can’t easily access the hot tub! Provide enough room for people to easily come and go. Air circulation. Your unit will require ample space to allow for proper cooling measures. Maintenance needs. Regular care will keep your water hot for a long time to come, so be mindful of space requirements for maintenance demands. Cover storage. When your hot tub is in use, it’s important to have a viable space for the cover that does not impede the rest of your deck. Depth. Placing your hot tub on top of the deck makes sense, but if you decide to keep it level with the surface for easy concealment, be prepared to plan for a lot of space usage underneath. Scenic views. For many Coloradans, a deck installation helps to gain unobstructed views of the beauty our state has to offer. Your tub placement can take advantage of gorgeous mountain views, sprawling grasslands, or even the new garden gnomes you’ve installed nearby! Privacy. Many residents enjoy privacy when relaxing in their backyards, making it important to consider the views that others will have of you while in your hot tub. Consider the angles for your neighbors, nearby traffic, and even the interior of your home for the best outcome. Convenience. Incorporating your hot tub installation with features such as outdoor kitchen designs can help take the decking experience to the next level. While you may not want the two side-by-side, incorporating benches and other features in close proximity can make the tubbing experience that much better! Sunshine. While most people imagine soaking in their tub in the evening, this heated device can also be utilized during the daytime. That being said, be sure to put your hot tub in a spot that offers your ideal blend of sun and shade. There are many options when it comes to outfitting your outdoor living space in Larimer County, and Rocky Mountain Fence is here to help every step of the way. Be sure to check back next time for more tips, or call our decking company in Loveland for an estimate for your project!